I love chocolate, I love chocolate bark! Did I say, “I love chocolate bark”! I have tried out so many good recipes for chocolate bark, but I must say, I think this one takes the winning spot in my book. 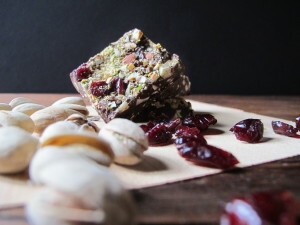 It was easy to make and loaded with some of the best of all flavors that I love, nuts, dried fruits, coffee and chocolate. Enough said, here’s the recipe, hope you will make it and enjoy it this holiday season, or like me, it will be eaten year round. 1 1/4 cup of roasted, chopped mixed nuts, I used almonds and pistachios but any you like will do. Roast your chopped nuts and set aside. Prepare a cookie sheet, I usually just line with parchment paper for easy breaking of the bark once it is set. Melt your chocolate either in the microwave or I prefer over the double boiler. Stir in about half the nuts and fruits into the warm chocolate. Spread this over the cookie sheet, top with the remaining nuts, fruits and now the coffee beans. Let set in the refrigerator till hardened. Then break into chunks. This entry was posted in From the kitchen, Recipes and tagged chocolate bark, homemade candies by admin. Bookmark the permalink.